Magnum celebrates the arrival of Magnum pints, the newest way to indulge in premium cracking Magnum chocolate and ice cream, available for the first time in Asia and exclusively in Singapore. To launch this indulgent new format, Magnum proudly presents an immersive and interactive Larger Than Life Indulgence installation. For a limited two week period, guests will be treated to an extravagant array of indulgent magnum moments, carefully #MadeToBeBroken. For the ultimate photo opportunity, strike a pose with the Larger Than Life Magnum Pint and golden spoon, the installation’s centerpiece. Modelled after the actual pint, the Larger Than Life Magnum pint shows how a spoonful of indulgence gives you larger than life pleasure. Step into The Indulgence Room—set within the Larger Than Life Magnum Pint—to enjoy a camera experience which captures you frozen in time for the ultimate selfie. Interact with Magnum chocolate shards, golden spoons, picture frames and other sofa-moment themed props in your very own take-home video with yourself at the center of the action. 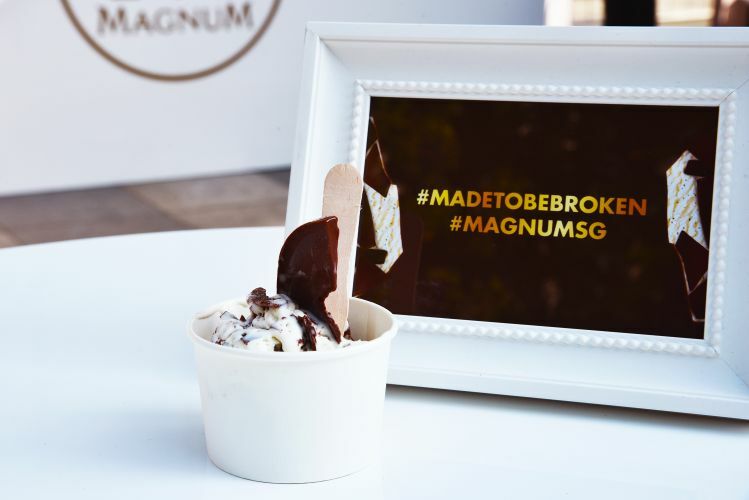 To sample and experience the newly unveiled Magnum pints, Pleasure Seekers can head to the #MadeToBeBroken Bar at select times of day (12pm and 6pm) for a free scoop of ice cream served straight from the Magnum pint (Classic, Almond or White) of their choice.